Over the last four years, in some capacity, the Eck Institute for Global Health at the University of Notre Dame has had the privilege of collaborating on a blended learning global health course with TechChange, an online learning social enterprise, based in Washington DC. The students from Notre Dame are part of the master of science in global health program. The objective of this association is to provide our global health students the opportunity to learn theoretical, as well as practical skills in the interdisciplinary field of ICT4D (Information and Communication Technologies for Development) and digital health. As opposed to a standard full three credit course, this ICT4D and Digital Health course is two credits, in a blended learning model, combining in-class instruction with online material from TechChange. Why did Notre Dame choose to enroll in TechChange’s online course? TechChange has a strong history in providing online education in the international development sector and we’ve felt this is something essential to offer to our students, as technology continues to change global health programming. We’ve found TechChange to be enthusiastic and responsive in working with us on shaping the curriculum of the online course each year. The course offerings and curriculum from TechChange have been well-structured, insightful and professionally designed. Additionally, from a curriculum standpoint, the TechChange team puts a great deal of consideration into content to stir the critical thinking of the students. One of the greatest challenges with online learning is the asynchronous nature of the online experience. TechChange closes this gap through live sessions with Google Hangouts, student participation in panels and live session Q&A. 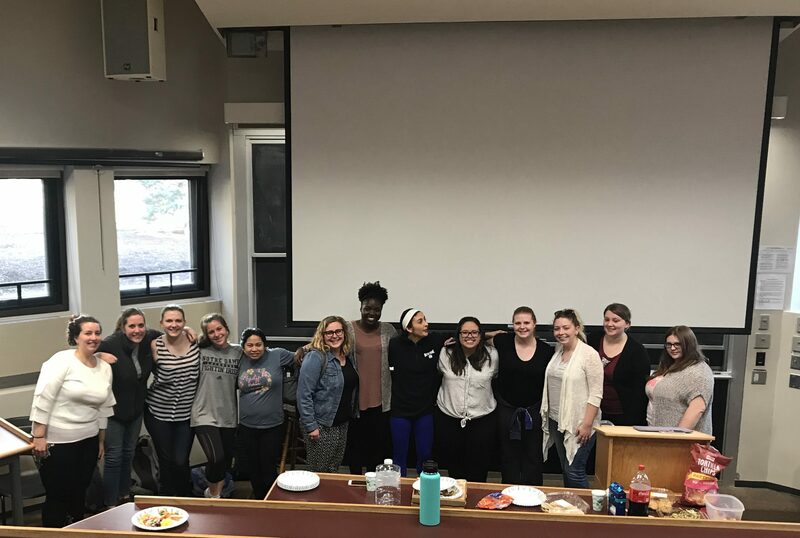 As part of the in-class experience, the Notre Dame Global Health students are required to lead discussion sessions following each week of the TechChange online course. This ensures the students are fully engaged in the course content and encourages their own critical thinking on the material. A student leads a discussion on Blockchain and its applications to global health. How did the blended model actually work? What were the moving parts? What are advantages of this type of blended class format? Close attention is paid to the TechChange curriculum to ensure there is sufficient continuity in topic areas, without a duplication of content. The course was structured in such a way as to provide the students a broad overview of digital development and more specifically some case studies using technologies in global health research and practice. In addition to the TechChange (TC310) four-week curriculum, the course is built to augment the learning experience with supplementary in-class material, with a core focus on the Digital Principles. This includes short lectures, student led sessions and video segments called Voice of the Practitioner, where students can hear from professionals working in the digital health field, from a variety of geographies. Much of this course material is loaded and organized in the Sakai Learning Management System (LMS) here at Notre Dame. 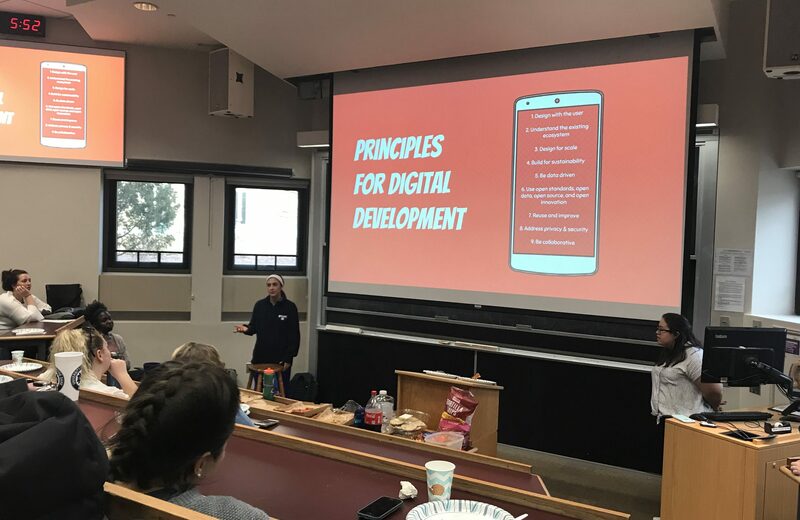 Furthermore, a series, referred to as AppLabs, puts the students in touch with some of the technologies used in the digital health discipline including Dimagi’s CommCare, Ona.io and TextIT. Future AppLabs will include GIS components. The objective of the AppLabs is for students to get a taste for some of the more accessible solutions available in the ICT4D and digital health landscape. The main advantage of this type of blended learning format is to provide breadth and depth to what the students experience, allowing them to consume a wide variety of content outside of class and use our in-class time for deeper discussion. Bringing in multi-modal learning experiences, by hearing direct from practitioners, reviewing case studies, research publications, “grey literature”, media and application lab exercises – enhances the learning experience. We feel by blending the learning environment we are able to improve the knowledge retention of the students due to their differentiated learning styles, with a goal of meeting the students where they are from an academic perspective. Students answer questions on technologies used in digital health data. What was your role as the professor on record? How did you structure class time and assignments around the TechChange course? I see my role as instructor of record as not just faculty, but advisor, consultant and content curator. We are constantly looking at ways to improve the course content and develop new paths to learning. To supplement the course content, I also engage campus guest speakers throughout the semester which include experts in Monitoring, Evaluation, Research and Learning (MERL), data science and GIS. Students received grades both through our in-class work and the TechChange course. The course assignments involve presenting on the TC310 weekly topics and leading those in-class discussions, as well as a final paper in which they research and analyze a recent digital health programme or technology platform. Rubrics are used so students have a clear understanding of their performance expectations, across all aspects of the course. A student gives a presentation on Digital Principles, the course’s core focus. What impact did the course have on your work and/or your students’ work? Perhaps the greatest challenge with this type of class is the amount of time it takes to prepare and execute effectively. This course is taught outside of my primary job responsibilities, so it can be difficult to be fully prepared for each class. Class sizes are intentionally kept small to control the resources needed to properly engage the students. My work has been impacted by motivating me to constantly improve the offering and deepen my own knowledge of ICT4D and digital health applications. 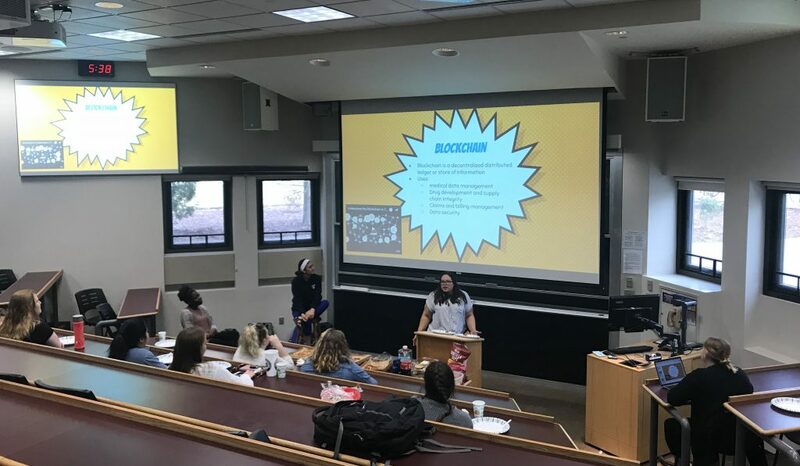 A highlight of the course was a student planned “mHealth Party” at the end of the semester to share their research and papers to a wider audience. 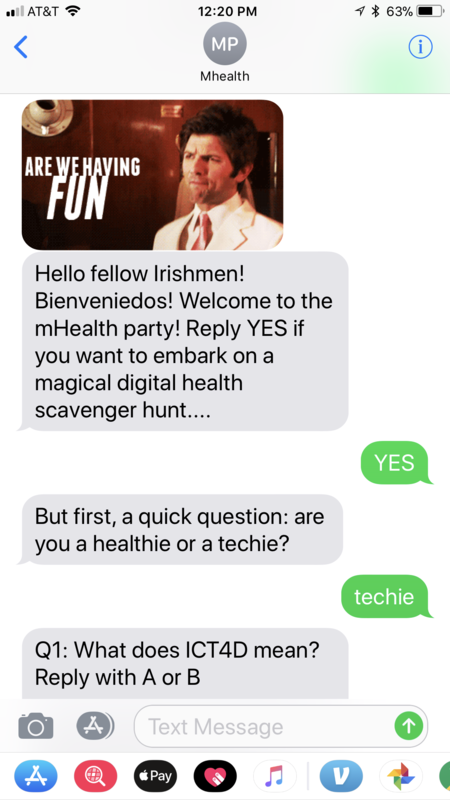 This was done in a fun, relaxed setting, complete with snacks, beverages and a gamified SMS scavenger hunt using a TextIT flow. What are the biggest challenges with this model? What advice would you have for other programs who might want to try it? My advice to other higher education institutions that would like to try this, is to plan exceedingly well and ahead of time, and to ensure the learning objectives are clearly defined from the start. Additionally, it’s important to find the right mix of content in the curriculum both in-class and online to energize the student learning potential. Finally, great care should be taken to ensure the students are on track and gain a deep understanding the material presented. The semester long course is capped off by bringing in a special guest lecture by a subject matter expert in the discipline. We’ve been very fortunate to have the support of the Eck Institute for Global Health to bring this incredible thought leadership to campus. Finally, I believe it’s imperative that we approach global health education from a multidisciplinary approach, bringing in a variety of perspectives, knowledge and methods. By using a blended learning model, our students are able to engage with a broad array of course content and experts. 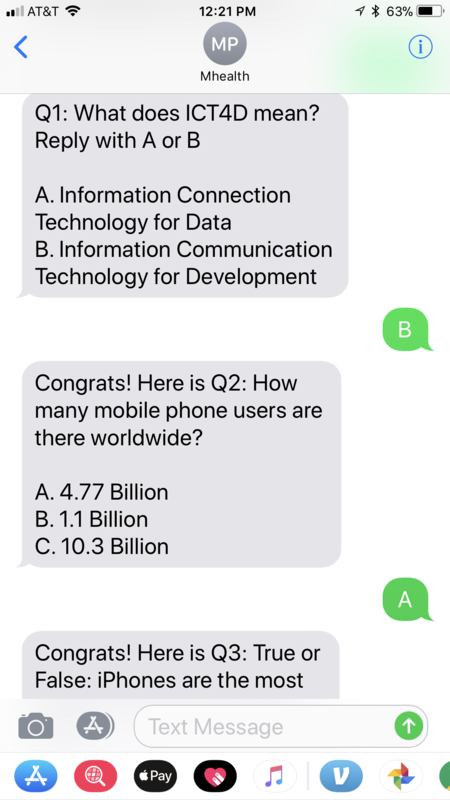 The objective is not for them to learn to code, but be prepared to understand how technology solutions can have a positive impact on global health programmes and research. A group photo of the participating Notre Dame M.S. students.